A rendering shows where Tishman Speyer plans to build a nine-story condo building and a park on Pier 4. Thirty-five years ago, restaurateur Anthony Athanas had visions of new office towers and condos rising from the windswept piers between his iconic Anthony’s Pier 4 and Fort Point Channel. Soon, they’ll rise from the site of his old restaurant. of the nine-story luxury condo building it plans to put up on Pier 4 and a one-acre park where the now-empty Anthony’s still sits. Along with a 13-story office building that Tishman plans toward the middle of the pier, it’s the latest in a wave of development that has remade the barren docks since Athanas’s day. Pending design approval by the city, Tishman hopes to start construction before the end of the year and to open the office building in 2017 and the condos in 2018. The restaurant, which closed in 2013, will probably be demolished next spring. The 100-unit condo building would be curved to maximize views of the downtown skyline. At the end of the pier would be a one-acre park, open to the public, and a plaza. The park would both preserve public access to the waterfront and allow the developer to command premium prices for condos with uninterrupted water views, said Vivien Li, president of the Boston Harbor Association, an advocacy group. Tishman hasn’t set prices on the condos, but units in a new building nearby on Fan Pier that were priced in the millions sold out quickly. 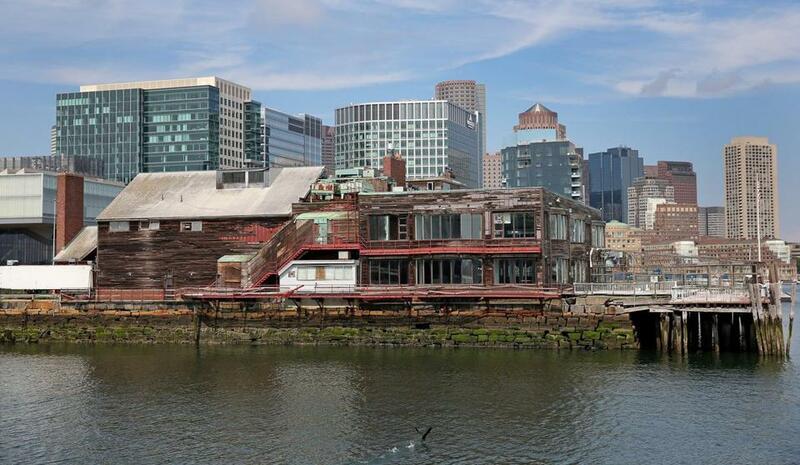 Tishman bought Pier 4 for $70 million this year from New England Development and is partnering with two Chinese insurance companies on a $500 million redevelopment plan, making Pier 4 the largest Chinese investment yet in Boston real estate. Co-chief executive Rob Speyer said his company wants to create a project that will bring new residents and new businesses to the new neighborhood. New development along the waterfront surrounds the former restaurant, which closed in 2013 and will probably be demolished next spring. 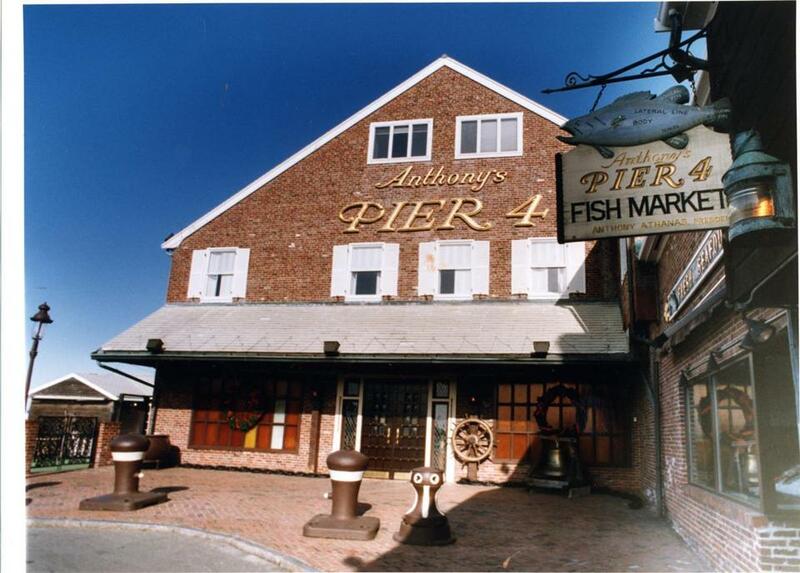 There was a time, though, when Anthony’s Pier 4 was the biggest reason many people made the trip over Fort Point Channel. Its massive dining room with unparalleled views hosted Hollywood stars and local politicians, as well as generations of regular Bostonians out for a special-occasion dinner. At one point it was one of the top-grossing restaurants in the United States, known for its classic seafood dishes and baskets of steaming popovers. 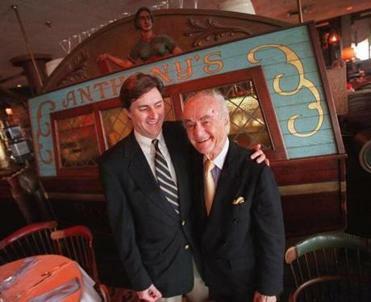 Anthony Athanas (right), the late founder of Anthony’s Pier 4 restaurant, celebrated his 89th birthday in 2000 with his son Michael. Athanas, the Albanian immigrant who founded the place and greeted diners well into his 90s, had big designs for the largely empty neighborhood around him. At one point he owned all the land out to Fan Pier and planned a big development of office buildings and housing. But legal disputes with his partners, the Pritzker family of Chicago, stalled the project and Athanas eventually lost most of the real estate, except Pier 4. In the late 1990s he sold development rights to New England Development, and a decade later, building in the Seaport finally took off. He died in 2005. And, Li notes, the Seaport District today still draws people to its restaurants. They’re of a different era than Anthony’s and its departed neighbor, Jimmy’s Harborside, but they bring people in. Li said she tried to get dinner early one weeknight recently. It was an hour wait. It is possible that the new condos, or their office building neighbor, could have room for a new Anthony’s Pier 4. Both will have ground-floor retail and restaurants. And Athanas’s sons still retain an option for a restaurant on the site, said family spokesman George Regan, though they have made no decision on whether to exercise it. If he could see it now, Athanas would probably be glad about what has become of the neighborhood, Regan said. But he would be gladder with one change. “I think he’d only really be happy if there was a big Anthony’s Pier 4 out there,” Regan said. 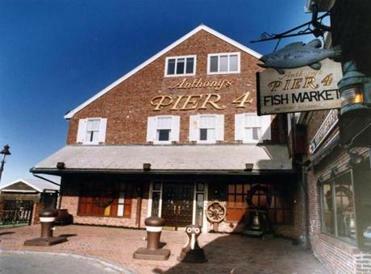 Anthony’s Pier 4 in its heyday, 1991.